Serving your entire home organization needs is what we do. Whether you start with closet organization, specially designed cabinets for your garage, or a Murphy bed, we're here to help you! Closet Factory is the authority on custom storage solutions. From simple to spectacular, we design around you and your specific wants and needs. Maximize your space's efficiency and simplify your life with the beauty of organization. It all began over two decades ago when we engineered the industry’s first true custom closet organizers. 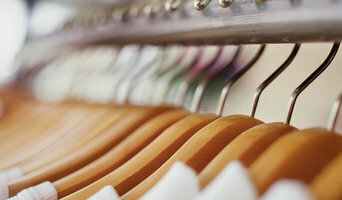 By continuing to set new standards in client care, customization, and craftsmanship, Closet Factory grew to become a leading franchise in closet organizers with dozens of territories throughout the United States. This national network of individuals is dedicated to creating the personalized closet storage solutions right down to the last drawer handle. So whether you’re a client in Los Angeles or Boston, you’ll find the same high-grade materials, lifetime guarantee, professionally trained Designers, and excellent workmanship that defines Closet Factory as the industry standard as well as a company. New England Closets offers closet design solutions in Woburn and the greater Eastern Massachusetts area. We have over 25 years of experience and knowledge upgrading closets for our Massachusetts consumers. In addition to traditional reach-in and walk-in closets, our Closet Works Inc. line offers solutions for offices, mudrooms, garages, and guest rooms. Plus, our ShelfGenie line will continue to offer great solutions for closet pantries for food storage and accessibility and other areas that can benefit from pull-out shelves. Contact us today at 781-670-7730 for a no-cost, no obligation in home design consultation! We have 30+ designers and 8 showrooms throughout New England. California Closets offers the tools needed to organize and inspire any project and any design. If your home is in disarray or you need to get clutter under control, it may be time to seek help from a Salisbury, MA professional. Professional organizers in Salisbury can help you get almost any space back in shape, whether it’s your office, a master closet, the kids’ playroom or the entire house. Before hiring a professional organizer, consider exactly what you need. Have you just moved into a Salisbury, MA home and have no idea where to put everything? You may want to consider an organizer who specializes in room-by-room space planning or estate organization. Perhaps you’re faced with a tiny closet and an overflowing wardrobe. In that case find a professional who focuses on closets to help you get back on track. Also consider the types of objects that need organization. Are they items like books, family photos, files or collections? You’ll want a professional organizer who has experience designing custom systems with Salisbury, MA companies that will best fit your needs. Find a professional closet and home organizer on Houzz. Narrow your search in the Professionals section on Houzz to Salisbury, MA closets and home organization.